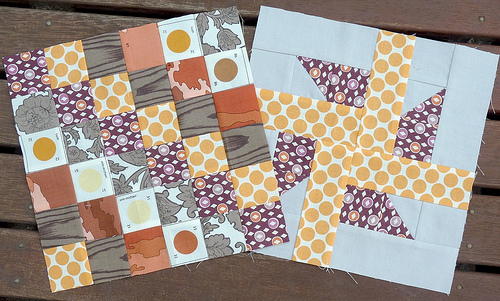 It is John from Quilt Dad's turn this month to receive swap blocks. John requested 9 1/2 inch blocks with "the sky's the limit" block design whilst still reflecting your own style. 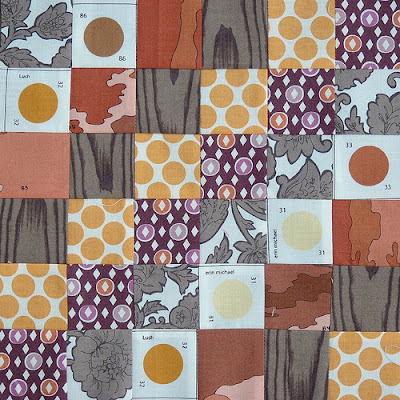 The fabrics sent by John were a compilation of much sought after Lush fabric by Erin Michaels, Lotus by Amy Butler, and Hope Valley by Denyse Schmidt. 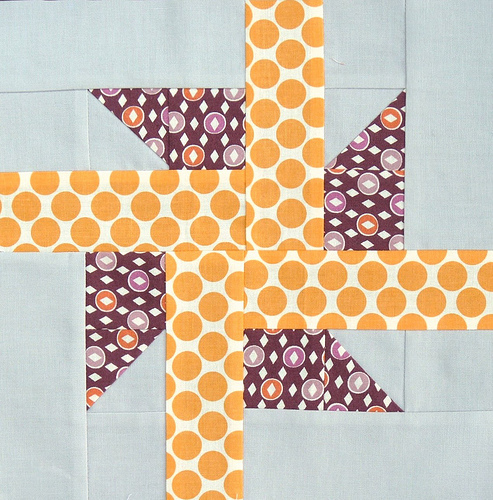 I really enjoy using modern fabrics and simple piecing to make these fun blocks. The design of this particular block (above) is from my new Quilter's Album book by Jinny Beyer, and is called Pudding and Pie by Alice Brooks. It was taken from an unidentified newspaper clipping, date unknown. I found it easy to re-size and recreate. These blocks are winging their way back across the Pacific Ocean. This fabric is certainly well traveled. You have done a fabulous jobs with these blocks - love them! Beautifully executed Rita! So perfect. These are stunning Rita, my fabric arrived today...you have set the bar high! What lovely blocks, beautiful colours. Would love to get hold of a pattern for that second block. wowser - GREAT work! Makes me want to join up!!! You did a wonderful job designing these blocks. They look fabulous. You did a fabulous job. I have never seen the "Pudding and Pie" block before. Quilt Dad did a great job putting the fabric together, too. I haven't done anything with the pieces of Erin Michaels fabric I have. These gave me some ideas. Thanks! That is a good combination of fabrics! OH! MY! I am in love with these blocks. Gorgeous!! gorgeous! love the colour combination! great blocks! I'm sure they will look wonderful in his quilt! Welcome to Sew n'Sell Rita! Just popped over and saw you'd joined up. Great to have you!